Everyone needs to read or convert PDF files once in a while, but no one really wants to deal with the annoyance of having to buy Adobe and deal with the myriad amount of updates that the PDF reader usually has. If you want to skip over all the issues of Adobe, PrimoPDF can be the PDF converter, creator and organizer that you have been wanting to get. This excellent software has been downloaded over 27 million times, and is rapidly becoming one of the best tools in the PDF-oriented world. Here are the few things that you need to know about this PDF converter. You don’t even have to open up the program to convert a file to a PDF. All you have to do to convert a file into a PDF is drag the file that you want to convert onto the PrimoPDF icon. You can choose your conversion settings based on size. You can have a PDF in the size of Screen (smallest files), eBook (Medium files), Print (Larger files), Prepress (Largest files). You can even have your own custom sized PDF files for your own unique purposes. Users can choose what to do with the new PDFs once they are done converting. You can choose to view them, mail them, or simply store them in your folder with the click of a button. It’s all up to you. You can change your document properties before they are converted. With PrimoPDF, you can change the title, company name, the subject, author name, and the keywords before the document is converted. You also can change your conversion settings and make your own default settings too. You can also add security to your documents with PrimoPDF. 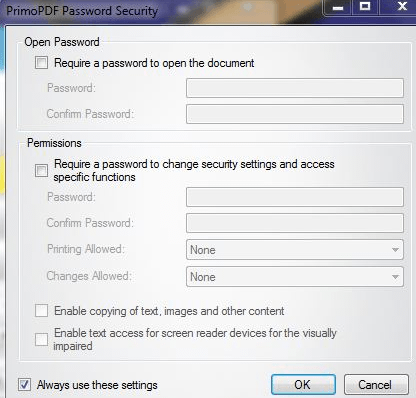 People who are concerned about the safety of their PDF can password protect their documents with PrimoPDF. You can use different passwords for each document, or you can password protect all the documents with the same password encryption using PrimoPDF’s advanced security settings. Print and PrePress conversions allow users to keep the photo-level quality in their documents…even after converting them! If you have been wanting to print posters, choose either Print or PrePress conversion options. These special settings preserve the quality of your documents to a photographic level, making each poster that you print look as crisp, clear, and professional-quality as you would hope it to be. Recoloring your documents is a snap. You can switch your PDF’s from Color to Grayscale or to Monochrome. 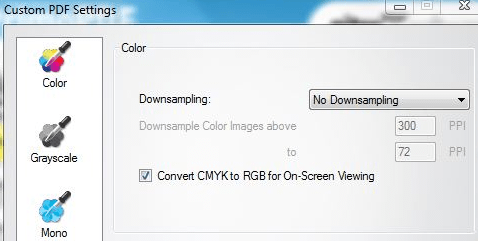 You can also set Downsampling, and convert the color mode, too. Updates can be done manually, or you can allow PrimoPDF to streamline everything for you. You don’t have to waste time updating your software if you don’t want to. Let PrimoPDF do everything for you! You can also be notified of updates, and troubleshoot update issues, making it one of the most user-friendly additions to this package. PrimoPDF gives you all the helpful links, tips, and information you need to get the most out of your PDF. 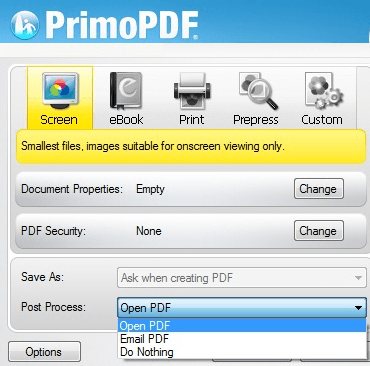 You get a quick guide on how to use all of PrimoPDF’s utilities with the software download. You also get quick and easy links that allow you to download a quick PDF reader, as well as PDF to Word and Excel converters. There is no guesswork in finding your converted PDF’s. Worried about losing your newly converted file in a temporary folder? Don’t be! It will always be saved in the same folder as the original file, so you never have to go searching for the new location of your converted file.